The author of the Book of Proverbs wants to make the reader desire wisdom. So here he depicts wisdom as a gracious hostess inviting us to a delicious banquet. The author of Ephesians continues to instruct converts on their new way of life in Christ. We hear how this way of life contrasts with other ways. Jesus continues his teaching about the bread of life. Last week he declared that the bread he gives is his flesh. This week he asserts that to eat this Bread is to have Life. All of that adds up to what we call wisdom, and the Bible's writings on the subject are called the Wisdom Literature. The Book of Proverbs is a major part of this Wisdom tradition. The writer wants to make people desire wisdom, so he uses many images to make wisdom attractive. In chapter nine, Wisdom is depicted as a wealthy, gracious hostess inviting the reader to a fine banquet. In later verses of the same chapter, Folly is described as offering one bread and stolen water in the company of shady guests. Our Liturgical Setting: The editors of the lectionary chose this passage because of its banquet imagery and wisdom theme. Jesus, the new wisdom, invites us to an even more excellent banquet in today's gospel, John 6:51-58, which you should read in preparation. Proclaiming It: How shall you proclaim this? With enthusiasm, as if you want people to come to your banquet, of course. Think of how you'd sound if you were a confident host or hostess inviting friends to a party of which you are really proud. The Historical Situation: Earlier chapters of Ephesians are about the full revelation of God's long-secret plan for the world. The plan, it is now clear to Saint Paul, was to nourish a chosen people for many generations, then, in Christ, to extend that chosen status to the former outsiders, too. The letter is from a long-time insider, Paul, a Jewish Christian. He writes to the new insiders, Gentile Christians, former pagans. Like many letters of Paul, this one starts with doctrinal considerations (explicating God's plan, in this case), then switches to moral teaching. 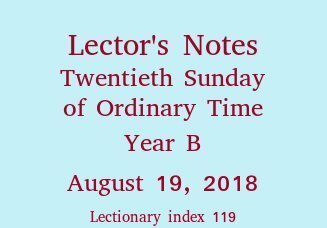 The Gentiles are so fortunate now that God has brought them into the orbit of grace, that their only proper response can be to live a holy life. In last Sunday's passage, Ephesians 4:30-5:2, the writer began a practical teaching about substituting good new behaviors for old bad ones, which continues in today's reading. The addressees are to avoid their former foolishness. They're not to get drunk any more, but to be Spirit-filled. Their talk is to be edifying. Proclaiming It: You could give this a straightforward, matter-of-fact oral interpretation. Better would be to imagine yourself a wise elder talking to a young adult whom you love. That's closer to Saint Paul's relationship to the Ephesians. Be sure you know the meaning and pronunciation of debauchery. 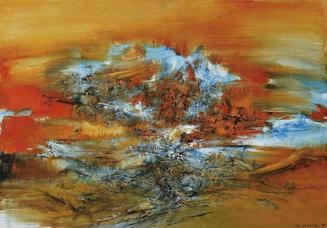 Zao Wou-Ki (Zhao Wuji) (Chinese-French, Abstract Expressionism, 1920-2013): "14-2-69", 1969. Oil on canvas, 54 x 46 cm. Private Collection. Image: © Christie's Paris. © This artwork may be protected by copyright. It is posted on the site in accordance with fair use principles. More, including a high-definition version of the work.